Are you looking for new markets? Are you looking to become part of a vitalistic group on a true mission to create change, while living your Lasting Purpose? Look no further. Life University is the world leader in providing chiropractic education, and LIFE Vision Seminar aims to become the leader in providing professional development opportunities for Doctors of Chiropractic and chiropractic assistants, congruent with Life University’s core values. The focus of LIFE Vision Seminar is to inspire all to live their Lasting Purpose by learning to Give, Do, Love, Serve out of a sense of abundance. LIFE Vision Seminar exists to educate, inspire and gather DCs and CAs from around the world. 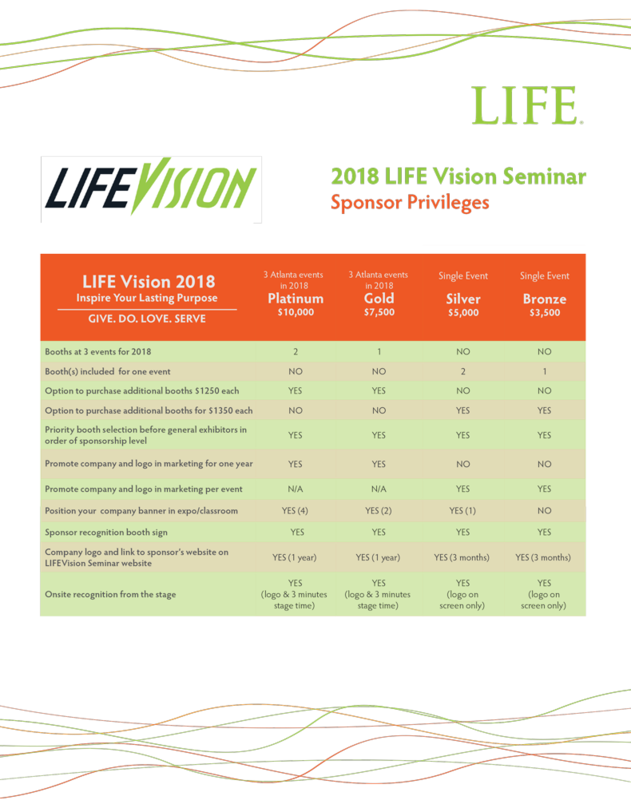 The LIFE Vision team is committed to identifying and implementing attendee needs by providing exceptional vendors congruent with the vitalistic paradigm. It also aims to provide world-renowned speakers, educators and mentors in philosophy, business practice, marketing, and CA development, as well as inspiring presentations that attendees can utilize in their daily practice and life. LIFE Vision Seminar strives to take this message global. Please find attached a booth application and a sponsor privilege legend. Please let me know if you have any further questions or if you would like to discuss opportunities over the phone or in person. We look forward to having you involved with this movement.